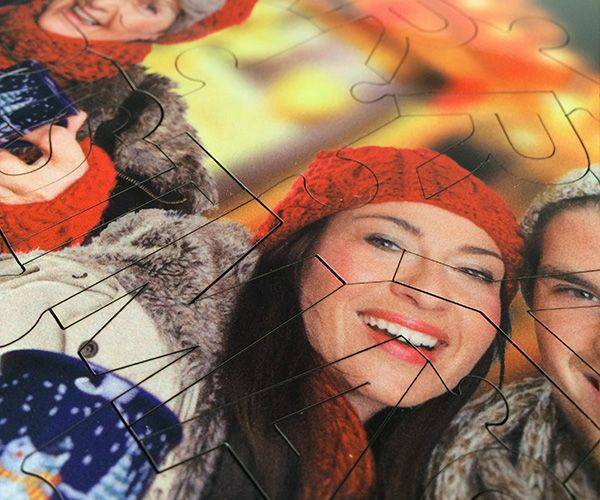 Create a wooden jigsaw puzzle with your own photo! This unique wooden jigsaw puzzle has a message "Merry Christmas" cut out as puzzle pieces, each letter is a puzzle piece. 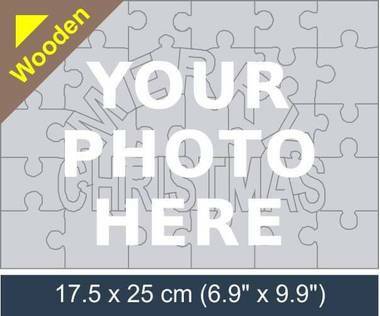 You can personalise this wooden jigsaw with your own photo. 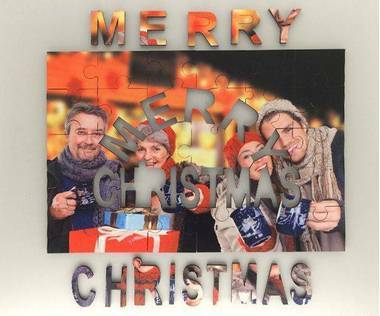 It will be ideal Christmas photo gift for your friend, colleague or family member! You can be sure that you will pose real joy in the receivers eyes with this personalised wooden jigsaw! At Christmas there are so many generic or tacky gifts that are brought out to tempt shoppers to part with their money that it is gratifying to see a high quality alternative. A picture of your choosing that has the message Merry Christmas on it will be a welcome addition to any pile of presents. There is no limit to the number of jigsaws you can order and as long as the picture and message is the same there will be a discount. To ensure a top quality product you are asked to make sure that the resolution of the picture you use is a minimum of 1400 px x 2000 px. When made up - and it will be made up much more quickly than you can imagine, it measures nearly 7” x 10”. 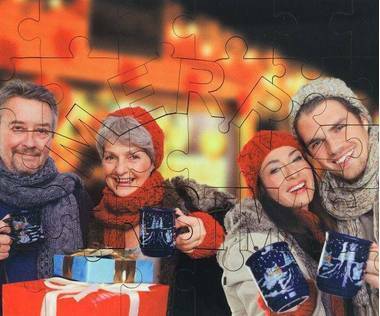 The Merry Christmas wooden photo jigsaw is designed in such a way that the picture will include all the necessary parts and there will not be a missing head or arm when the jigsaw is made up. As soon as the parcel is opened, it will be clear what is inside. 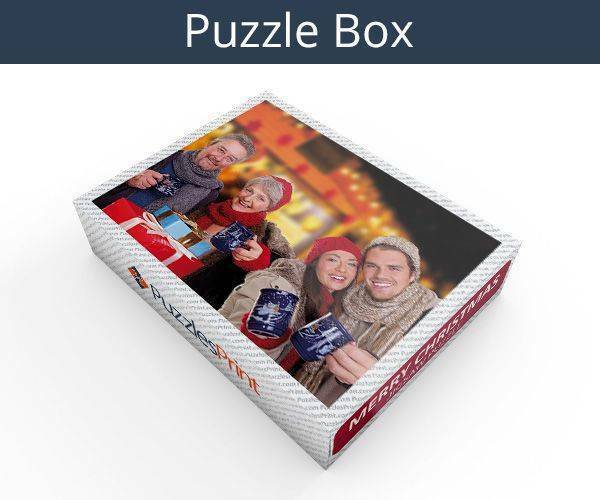 The picture will make it easy to see what has been received and once the Merry Christmas wooden jigsaw is being used, will show the user where each piece will go. It is bound to be a treasured possession and will be made up and broken down on a regular basis. The pieces are not all one size, so it will take a little time to do and will keep everyone entertained on Christmas Day. Once completed there is another use that can be found for Merry Christmas wooden photo puzzle. As the pieces are just 4mm thick it can be stuck together and covered. There will be plenty of things it can be used for – a wall decoration or mat that can be placed on the table. 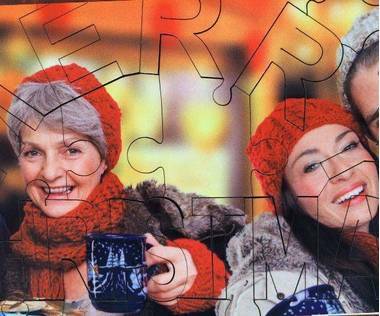 Despite the fact that it is a Christmas jigsaw, it will be a joy to look at all year around. It is likely that once one has been purchased there will be others in your life who are hoping to find one in their stocking the following year.